ChoiceOne Bank’s Culture Committee recently launched a “step challenge.” It took place among its 14 branch offices. The branch with the most steps at the end of the challenge won. The winning branch donated a $500 check to an organization of their choice. The ChoiceOne Cedar Springs Branch won the step challenge. The branch had nearly 40,000 steps. 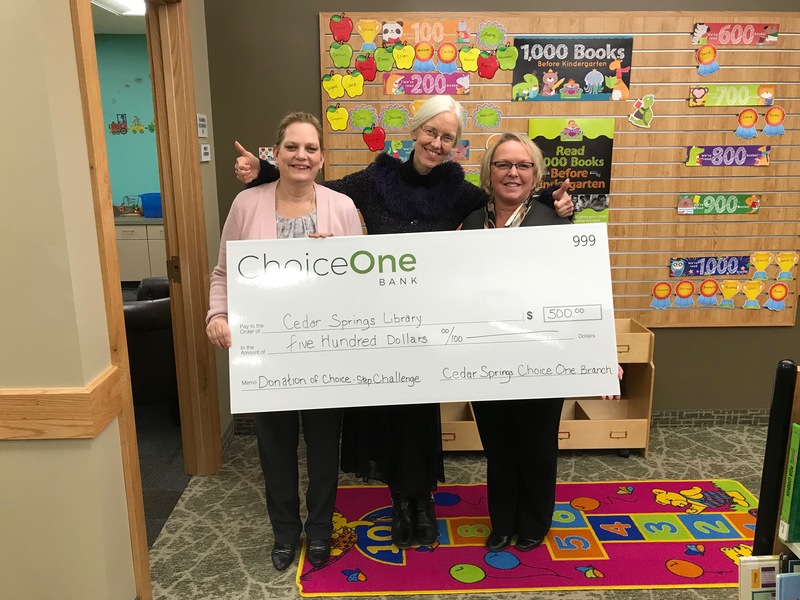 They chose to donate the $500 to the Cedar Springs Public Library (CSPL). From left Stacy Helsel, ChoiceOne Bank Cedar Springs Branch Manager; Donna Clark, Cedar Springs Public Library Director; and Denise Gates, ChoiceOne Bank Vice President, Retail Banking and Consumer Loans. ChoiceOne Bank’s Culture Committee was created two years ago. President and CEO Kelly Potes formed the committee. This was after updating the Bank’s mission and vision. With a mission to provide superior service, high quality advice and show our utmost respect to everyone we meet, and a vision to be the best bank in Michigan, this team was given the task of helping employees. The Culture Committee launched a Health and Wellness Program in 2018 and the “step challenge” paired well. The program encourages healthy lifestyle choices related to eating, exercise, and mental health. Healthy lifestyles and community support blend well for a community bank like ChoiceOne.